I’ve received word that this website is a finalist at the 2011 Philippine Blog Awards’ Food and Beverage Category. It has only been a little over six months when I decided to take a leap of faith, take the plunge, and pursue my passion of writing and producing content about food. Aside from the nomination already being an honor, for me the nomination is a great validation about my vision for this blog as a channel where food is celebrated as a means to share and bring people together. Of course, it is also a great honor being nominated along with fellow bloggers who are just as passionate with food as I am. This is my third nomination at the Philippine Blog Awards. My first was in 2009 for my old blog, ralphguzman.org. I won the Flippish Viewers Choice Award. Last year, ratedralph.com was nominated for best personal blog — back when this blog was about everything under the sun. And this year, ratedralph.com — now in its truest format — has been nominated for the food and beverage category. Thank you, Philippine Blog Awards. But most especially, thank you to all of you friends and readers for supporting this blog. Thank you for reading, making the recipes and sharing them with your loved ones! This entry was posted in A Foodie's Thoughts and tagged Philippine Blog Awards, ralph guzman, RatedRalph.com by Ralph. Bookmark the permalink. Masaya kami nang tinawag ang pangalan ng blog mo bilang winner! Next → Next post: Thank You! 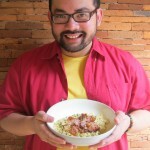 RatedRalph.com: Best Food & Beverage Blog at the 2011 Philippine Blog Awards!